Here’s a pattern for a 6-gore wraparound skirt. It has a generous wrap and is very suitable for one-way prints. It would also look good in a plain fabric with topstitched seams. 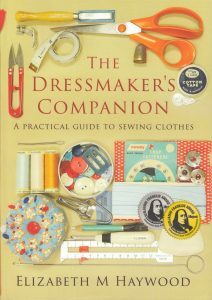 If you’ve never drafted a pattern before, this is a good one to start with because it’s straight forward and easy-fitting. You’ll need your waist measurement, a ruler, pencil and L-square, and of course paper. This is a step-by-step, but there’s a summary at the end so scroll down if you want the overview first. 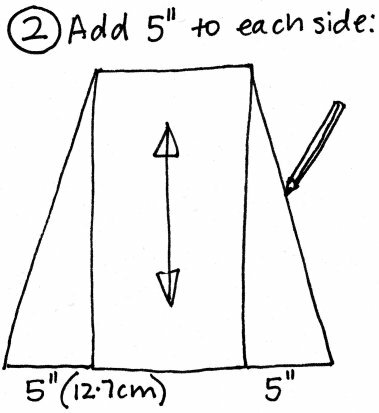 Step 1: Draw a rectangle as shown. My waist is 30″, so my rectangle is 7.5″ wide. 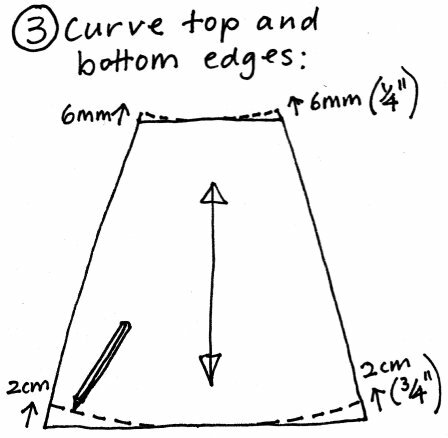 Draw in a central grainline (fold the paper to find the perfect centre). 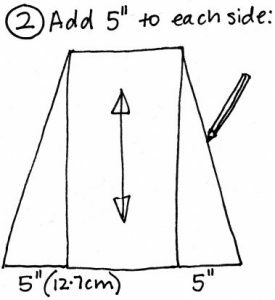 Step 2: Add 5″ to each side and connect to the top corners with a diagonal line. Step 3: Create pleasing curves at the top and bottom. Mirror them on each side by folding the paper along the central grainline. 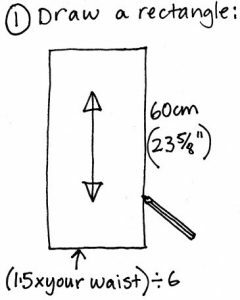 The sides should measure 60cm. Step 4: Add whatever seam and hem allowances you prefer (shown are what I did). 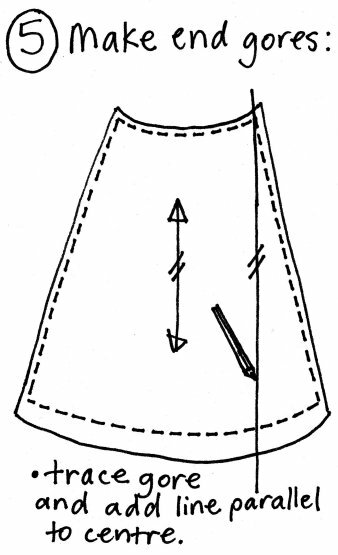 The curved hemline will not accommodate a hem deeper than 1″. You can also adjust the length now if you want to, keeping the sides on the same plane and extending them with a ruler. You may also increase the amount of flare at the sides, but don’t decrease any or the skirt might be too tight around the hips. This pattern piece is now finished -you’ll cut 4 of them for the skirt. Step 5: The skirt also needs a differently shaped panel at each end of the wraparound. Trace around the pattern you’ve just made, and add a line parallel to the centre grainline. The line should run through the stitching line at the top corner. 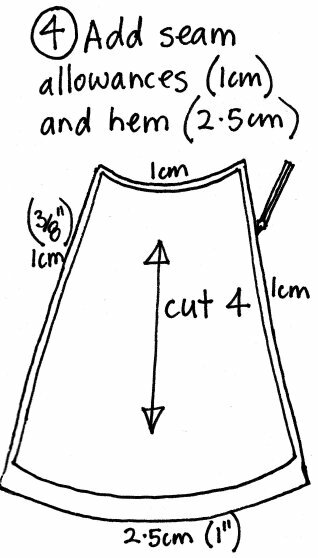 Step 6: Add a hem to the straight line you just drew. 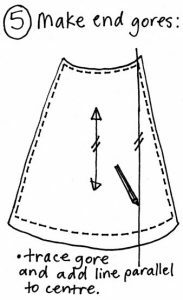 Make it the same as the hem allowance on the skirt and you can do a mitre at the corner. Straighten off the lower edge so the corner is 90 degrees. This pattern piece is now finished. You’ll need to cut two as a pair. Step 7: The last pattern piece you’ll need is a waistband. The part that’s attached to the skirt needs to be 1.5 times your waist measurement. Note that the ties at each end are different lengths. On my skirt, I made the one on the right 21″ long, and the one on the left 33″ long. The buttonhole needed to bring the tie through should be located between panels 3 and 4. 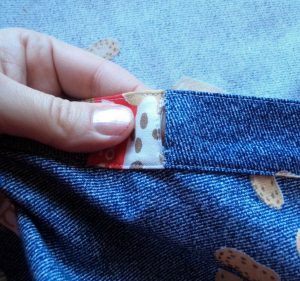 Instead of a buttonhole, you can make a join in the waistband with a gap for the tie. 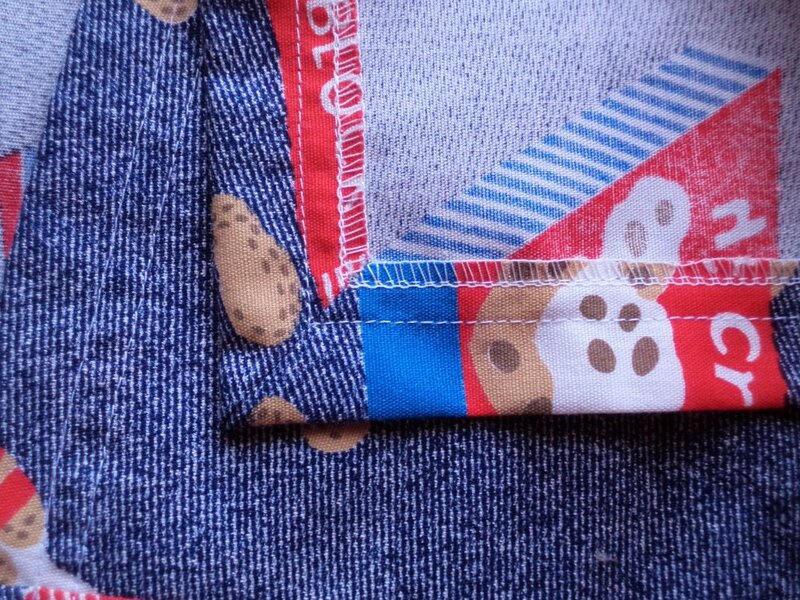 BTW, I cut my waistband at 3.25″ (8.2cm) wide, to finish at 1.25″ (3.2cm) wide. Here’s the summary. 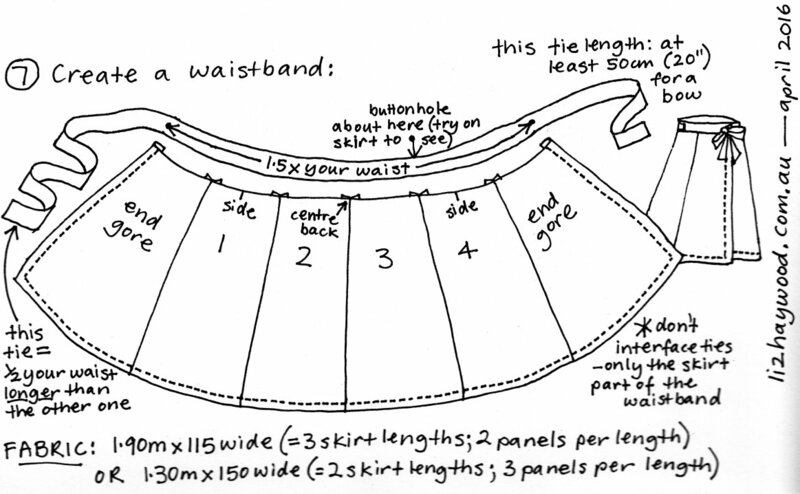 You may also be interested in the Zero Waste wrap skirt draft. 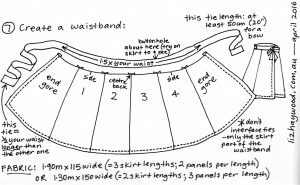 You can probably work out the sewing order from my drawing: 1) join all the panels together 2) do the mitres and hems 3) attach the waistband and make the ties 4) make a buttonhole in the waistband. 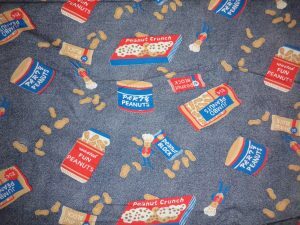 I made my skirt using some very old novelty print fabric with peanut-themed print. The pattern pieces barely fitted across its 90cm width. I think it’s cotton, about quilting weight. Anyone got any ideas how old this fabric might be? 1970’s? 1960’s? Even 1950’s? The colours are most accurate in the pictures of me wearing it. I mitred the corners and sewed the hems with two rows of stitching. The buttonhole in the waistband. It’s positioned almost between panels 3 and 4. 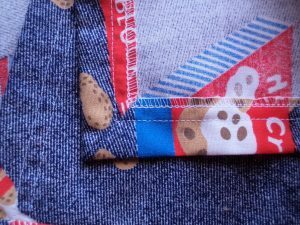 Originally I had a join in the waistband with a gap, which I positioned in the centre of panel 4, but it wasn’t far around enough so I made a buttonhole further along. If you do decide to have a gap in the waistband, trim back the seam allowance inside the waistband so it doesn’t show through the gap. Update: This has become by far my most popular post ever. 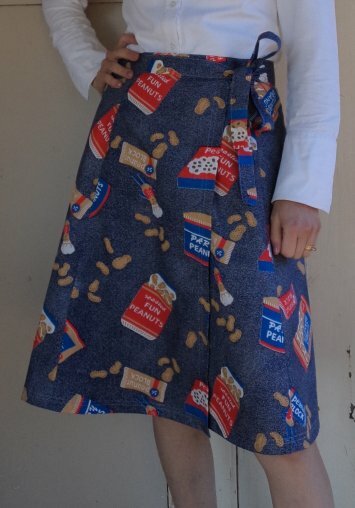 If you’ve made this skirt, please feel free to leave a comment and if possible a link where we can see your great work! Another update: This skirt can be made with 3 gores. Click here to read how. 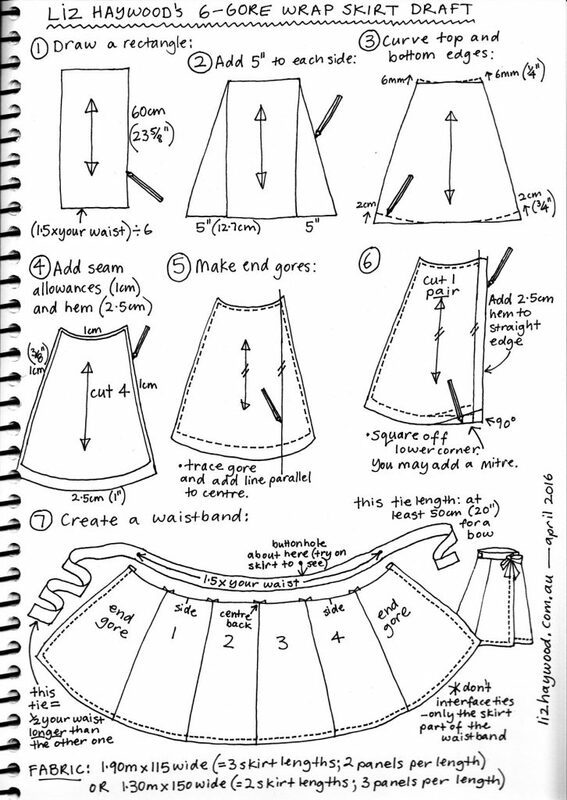 Thank you for posting the “easy to understand diagram” of how to make a pattern for a wrap skirt. I had been thinking if I could make a wrap-around skirt pattern of “fits in various sizes” before. But looking at your pictures and calculation, I thought it might be difficult to make such a pattern, at least for me. But I can make a pattern for myself following your direction. Thnak you. By the way, you are such a brilliant drawer and your writing is beautiful! Thanks, Chiggy, I’m sure your wrap skirt will be great! You’re welcome, I hope you enjoy wearing it too. If i want it to wrap twice around would I just do the waist measurement x 2 or 2.5? Hi Julie. Do it 2x the waist. 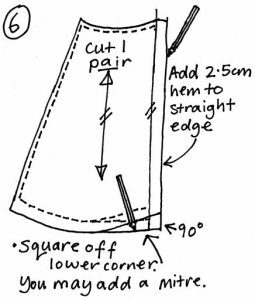 The width of the rectangle in Step 1 would therefore be (2x your waist) divided by 6, and then the skirt will be a double layer of fabric all the way around when it’s worn. Approximately how many yards of fabric should I purchase to make this skirt? Hi Rebecca, the fabric requirements are at the bottom of the draft. 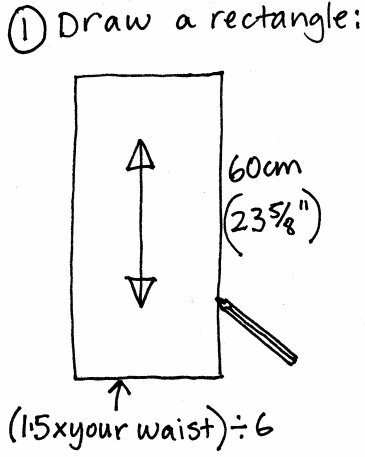 A yard is only 3″ short of one metre. If you aren’t sure, take your pattern along to the fabric shop and get the sales assistant to help you. I’m not sure how I missed that. Thanks! That’s ok! I forgot to write that if the fabric is one-way (like mine was), an unusual width or if your skirt is a large size you’ll need to do your own layout. Many thanks for the pattern. 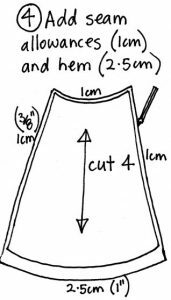 If I want to make the skirt longer, do I just add the required length at the bottom of each part? For example 15 centimetres? I am quite tall and like longer skirts anyway. Hi Sophie. Yes, just add onto the bottom of each panel. 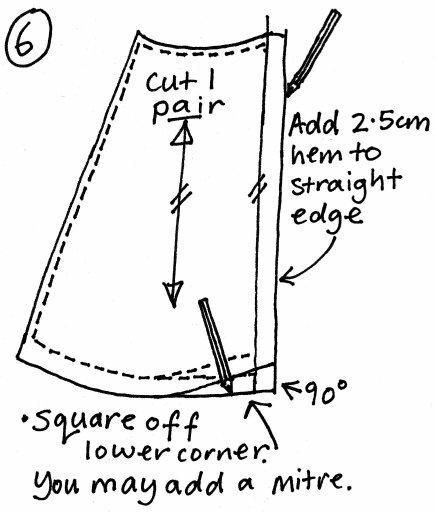 Extend the sides with a ruler to meet the new hemline. C’est facile! I hope you enjoy making and wearing it! I’ve made several skirts from this pattern using SARI fabric bought off eBay! PERFECTION! Fantastic! Thank you so much for commenting. This post has had well over 100,000 visits and I sometimes wonder how many skirts got made and are in the world being worn. I bought a lovely remnant at Spotlight today (when I bought my new machine ). They marcked it as one metre, but it’s almost 1.5, so I’m going to make this skirt. I might even wear it up for a visit…. Excited to hear about your new machine and honoured that this is one of your first projects on it. Looking forward to seeing it. Liked this so much I bought fabric! Hello Barbie, I hope you like wearing it as much as I like wearing mine. You’re welcome! Thanks very much for leaving a comment, and I hope you enjoy your skirt. 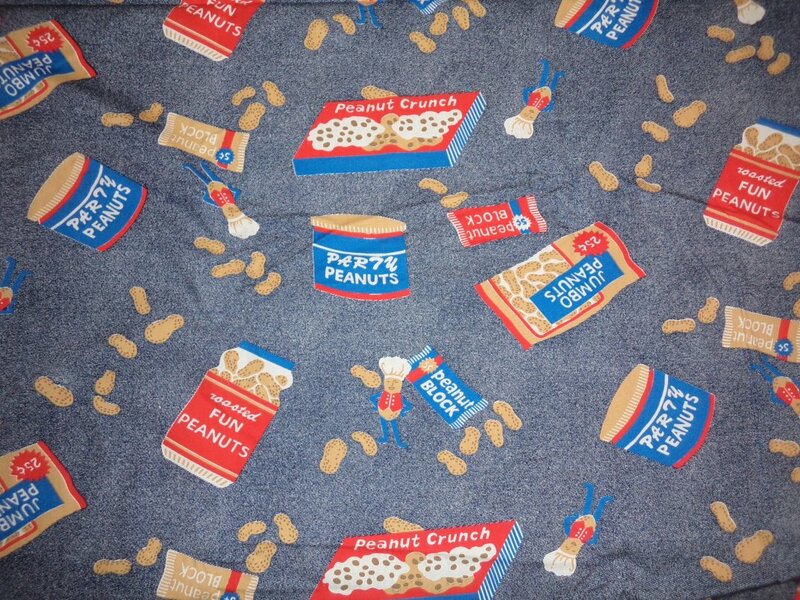 Super-excited to find this pattern to recreate a skirt I had in the 70s. I’ve been searching for a pattern to accommodate my unstable waist size & hips! Thanks Sally, I hope it goes really well for you! Love your page!! Thanks for the wrap around pattern. Normally I sew pretty slowly but this took me about 2 hours from laying out my pattern to finishing my hem. I needed a skirt for a funeral so had to rush thru. I didnt add the button hole and need to clean up a couple seams, but it fit great and looked very nice. Thanks for the easy to follow instructions!!! Hi Sandy, lovely to hear of your sewing success. Cheers! 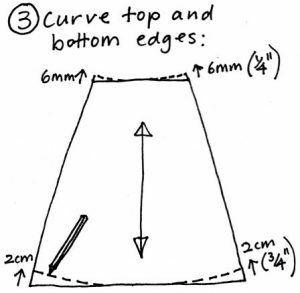 How would you change the calculations to make a three paneled skirt? Thanks! !